This is a really exciting development for the curtain pole market! Thanks to the research and development project from Rolls Neo we now have a bay window curtain pole solution suitable for heavyweight, eyelet curtains. Shop the full range here. 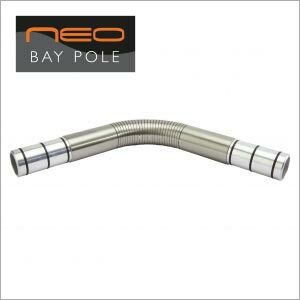 ›› Click here to download the New Neo Bay Curtain Pole Brochure (PDF). ›› Subscribe to our YouTube Channel for how to guides and announcements. The New Neo Bay curtain pole has been designed to perform at its best with eyelet curtains, however it can also be used on curtain headings that require curtain rings. The pole is available in a 28mm and 35mm diameter in any of the 4 Neo curtain pole finishes (stainless steel, chrome, spun brass or black nickel) and is available with all of their stylish and contemporary finials, including their Neo Original finials, Neo premium, Neo style and Neo oak finials. Please note this pole isn’t suitable for the oak poles, but the oak finials can be ordered on the metal poles and look great to complement modern interior design trends. If you are purchasing the pole for eyelet curtains we recommend a 40mm eyelet for 28mm diameter poles, and a 50mm eyelet for 35mm poles. These brackets have been engineered to the high standards you would expect from the Neo range. Being solid diecast the tubular design offers maximum strength and weight capacity providing a solution for heavyweight, eyelet curtains! The difference with this system vs others on the market is the fact that the end brackets offer enough support without the need for corner passing brackets. We have listed the bay curtain poles on our website with 2 options 1) for lightweight curtains and 2) for all other curtain weights. Lightweight curtains are typically not lined or inter-lined and a thin fabric such as a light cotton, sheer or voile. New Neo curtain pole brackets. 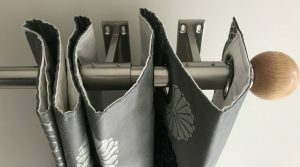 For ‘all other curtain weights’ two end brackets will be supplied for each end of the pole to offer maximum support. Please note your curtains will hide the brackets once the curtain poles and curtains are installed and fitted. For L shaped windows you will receive 3 end brackets in total. 2 to be positioned at the end of the longest pole and 1 to be positioned at the end of the shortest pole. The centre bracket has a simple, discrete and stylish design. It features a two-piece magnetic cover plate which simple slides into place and conceals the fixings underneath. It is recommended that 2 people help to fit the centre bracket so one person can hold the pole in place whilst the other person fixes the bracket to the wall. The well engineered corner piece is supplied as a 26cm single piece of straight pole, which can easily be bent by hand to create the angle required for your bay window. We recommend that you get the angle as close as you can in the first instance. You can do this by positioning the corner piece at the window to see how it is fitting. Don’t worry if it isn’t 100% perfect to start off with. As there is flexibility in the piece the metal will give as the corner pieces are connected to the poles giving the perfect angle. The easiest way to bend the corner piece is over your knee, however please place a cloth or t-towel over your knee to ensure the cut grooves in the pole don’t pinch your skin or clothing. Please ensure the cut section of the pole faces in towards you when bending. When bent the cuts should be facing into the room. Please be careful not to bend it the wrong way as this will cause damage. Please note the connecting pieces twist into the corner pieces. Please don’t push them as this will damage the components. There are clear ‘twist’ instructions on the connectors to guide you. Please also note the corner piece hasn’t been designed to be bent and straightened, and bent and straightened as this will cause damage. Please note the poles can easily be cut to size with a junior hacksaw. The poles in the Rolls Neo range are available in the following lengths; 120cm, 150cm, 180cm, 240cm and 300cm. Please get in touch if you would like to adjust the pole sizes and we can give you a quotation for your requirements. Please call us on 01590 615775 or email sales@thehomeofinteriors.co.uk. Where do I position my eyelets or curtain rings? Our YouTube video explains this in more detail. For poles that just has one end bracket you will position your curtain rings and eyelets as normal i.e. one in between the finial and the bracket with the rest to follow the other side of the end bracket. If you are fitting the pole with two end brackets please position one curtain ring in between the finial and bracket, one curtain ring in between the 2 brackets with the rest to follow the other side of the 2nd end bracket. 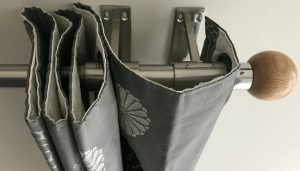 If you are fitting eyelet curtains there are 2 options for poles with two end brackets. For full curtains where you have plenty of fabric, we recommend you fit one eyelet in between the finial and the end bracket, then 2 eyelets in between the 2 brackets, with the rest to follow the other side of the 2nd end bracket. If your curtains aren’t that full please position one eyelet in between the finial and end bracket with the second eyelet the far side of the 2nd end bracket. For curtains where the fabric is more restricted. Please call us on 01590 615775 if you have any questions or would like a bespoke quotation. Shop the full Neo range of bay window curtain poles suitable for eyelet curtains here.